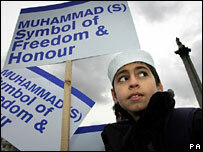 The spread of protests against the cartoons of Muhammad is another manifestation of globalisation. Just as Dr Edward Lorenz of the Massachusetts Institute of Technology asked in 1972: "Does the flap of a butterfly's wings in Brazil set off a tornado in Texas?" (he originally mentioned a seagull's wings, but a butterfly is so much more poetic), so these days cartoons in an obscure newspaper have set off demonstrations which cross continents. The phenomenon is fuelled by the growth of the Islamic influence in Western societies, the sense of Islamic anger not just at the cartoons but at world events and the precarious nature of relations between the West and the Muslim world. Compare the recent crisis with what happened to the author Salman Rushdie in 1989. Then, the protests were directed largely at one person. Now they are directed at a whole country, in this case Denmark, and more than that, against large parts of Western society and its traditions. Equally, the cartoons are seen as attacks on Islam itself, not just by an author but by a society. And in places, the issue has been exploited for local purposes. In northern Nigeria, the protests went beyond the original issue. They developed into anti-Christian riots, as anger at the drawings was exploited in a part of the world where Islam from across the Sahara meets Christianity which has moved up from the missionary-influenced coast. Rushdie's sin in The Satanic Verses was to exploit some notorious lines in an account of the Prophet's life which told how Muhammad was tempted by Satan to suggest that three goddesses worshipped in Mecca might find a place in the new religion he was proclaiming. These are the "Satanic Verses" themselves. They are absolutely rejected by Islamic tradition. Rushdie, however, used them to construct a fable in which he questioned the whole basis of Muhammad's teachings. It was on 14 February 1989 that the then Supreme Leader of Iran Ayatollah Ruhollah Khomeini proclaimed: "The author of the book entitled The Satanic Verses, which has been compiled, printed, and published in opposition to Islam, the Prophet and the Koran, as well as those publishers who were aware of its contents, have been sentenced to death." The book was burned, in Britain and elsewhere. Protests followed outside US and British buildings in India and Pakistan, and people died. But the main anger was directed against Rushdie himself who had to go into hiding. The Ayatollah's fatwa against him is still technically in force. 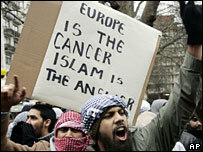 In the West, the protest was seen largely as a product of the Iranian revolution rather than a mass movement in Islam. At the time, Iran was seen as the great threat. Saddam Hussein's Iraq was even regarded by some Western leaders as a bulwark against the fervour of Iran. Ten years previously he had attacked Iran and the West barely blinked. An incredibly bloody war ensued in which Iraq used chemical weapons and Iran hurled its only-too-willing youth against Iraqi lines. There was no Osama bin Laden and no al-Qaeda. And there had been no 9/11, no invasion of Iraq. It was only Iran which declared that the United States was the "Great Satan". There was also a much less influential Islamic presence in Western societies. In Britain, there were indeed protests but they were small and politically not that influential, though the Conservative government did make noises about the need not to offend religious sensitivities. A minister tried to placate Iran, which was seen as the problem. The Rushdie affair can be seen as the precursor to the cartoon crisis. The Muslim leadership in the West is far stronger. Muslim leaders in Denmark were instrumental in transforming their local row into a global confrontation. They did this by taking their case to gatherings of Islamic scholars and politicians in the Middle East where they found a ready audience. From there, it went onto the streets. We are also in the middle of, and perhaps only at the beginning of, a period in which the West and Islam are in conflict (it is not just Iran any more), or at least are trying to establish rules of conduct. The West is having to reconsider what it means by freedom of speech and to justify, for example, why the historian David Irving is locked up in Austria for denying the Holocaust. In fact, that has to do with Austrian history. The law on holocaust denial applies there and in Germany because of their special responsibilities. And within Islam there is a great debate between moderates and radicals, the outcome of which will perhaps determine the outcome of the wider conflict. Into such an atmosphere came these drawings. The tinder box was ready to be lit. How can row be resolved?